What would life be without Jeera? Cumin Seeds ? Cumin is the dried seed of the herb Cuminum cyminum, a member of the parsley family. 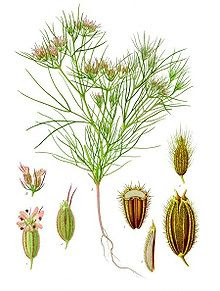 The cumin plant grows to 30–50 cm (0.98–1.6 ft) tall and is harvested by hand. It is an herbaceous annual plant, with a slender branched stem 20–30 cm tall. The leaves are 5–10 cm long, pinnate or bipinnate, thread-like leaflets. The flowers are small, white or pink, and borne in umbels. The fruit is a lateral fusiform or ovoid achene 4–5 mm long, containing a single seed. Cumin seeds resemble caraway seeds, being oblong in shape, longitudinally ridged, and yellow-brown in color, like other members of the Umbelliferae family such as caraway, parsley and dill. Just the word, jeera (cumin), brings to mind a host of Indian delicacies – Potato (aaloo)-jeera, jeera with lemon water, mung with jeera, steaming curries with a tadka of jeera. My God, the list is endless! Indian cuisine is unimaginable without this humble condiment. my grandmother dosing me with jeera when I had a tummy upset. If we kids suffered from flatulence or loose motions, we were fed powdered jeera in curds. Cumin is the seed of a flowering plant that is effective for curing nausea, purifying blood and clearing skin of various conditions. Also referred to as the friendly herb, jeera is used in Indian, African, Chinese and Mexican cuisine, and also added to baby food because of its mildness and soothing properties. Jeera is a natural digestive found in most Indian houses and is widely known to halt allergic reactions, prevent flatulence and stomach cramps. When mixed with water, lemon and salt, it gives relief during attacks of diarrhea, and is a wonderful digestive when roasted with salt and consumed after meals. When added to summer drinks it enhances their cooling properties. Jeera prevents morning sickness in pregnant mothers and helps the development of the foetus and eases childbirth. It is known to improve lactation in women and increases urination and thus prevents water retention. 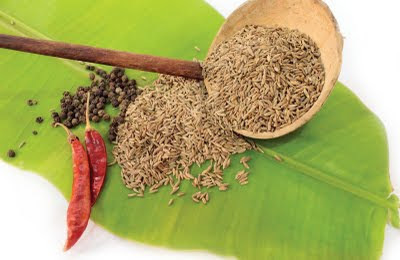 Cumin provides a good mix of nutrients: protein, fat, carbohydrate, iron, calcium and phosphorus. For those who find their sleep disturbed often or suffer from insomnia, cumin is an effective remedy. Nothing makes summer as special as a delicious sip of mango panna flavoured with jeera, or curd rice with jeera and kadi patta tadka. And how can I forget the delicious chaat with jeera and kala namak? chutney and coriander Serve chilled.